With the final results of election 2017 released today we can finally get a better understanding of where the parties performed well, and where they struggled. Generally the addition of special and overseas votes haven't change the picture too much, with National still growing their share of the party vote in nine out of Auckland's 22 seats, whereas before specials that was 12 out of the 22. Compared to my very first analysis of best and worst performers, I've made a few changes to help add some context to the statistics. You'll see later on the impact of this in that while Labour experienced huge party vote growth in the Māori seats, due to the lower turnout in those seats that growth didn't necessarily deliver them as many new votes as a smaller increase in say, Nelson. The new measure that balances this out "Extra votes gained/lost" is designed to show the impact of that change in party vote taking into account the turnout of a specific electorate. As I mentioned before, National's best performers remain in Auckland where they managed to grow their share of the party vote in nine electorates, and only in five electorates - North Shore, Tamaki, Epsom, Mt Albert, and Auckland Central - did they lose party vote share at a greater than average rate across the rest of the country (minus 2.69 percentage points). It seems very much a case that National was hurt in the inner city and urban parts of Auckland, Wellington and Christchurch, as well as in other provincial centres. It's interesting that the nine electorates that National has done well I've called their "Auckland mortgage belt firewall". Generally less affluent, more ethnically diverse than Auckland's northern reaches, as well as having fewer students and young people than Auckland's inner city suburbs, while these electorates don't provide the bulk of National's Auckland support, it's a lost opportunity for Labour as I'll discuss later. 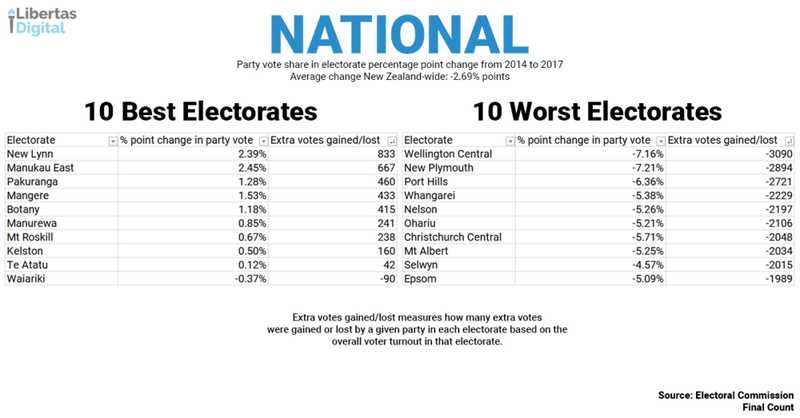 It's also worth pointing out that none of those nine electorates yielded large numbers of lost Conservative voters from 2014 either to boost National's numbers, meaning National's performance in them seems to be down to their own appeal in those electorates rather than shifting of votes that might have happened elsewhere. 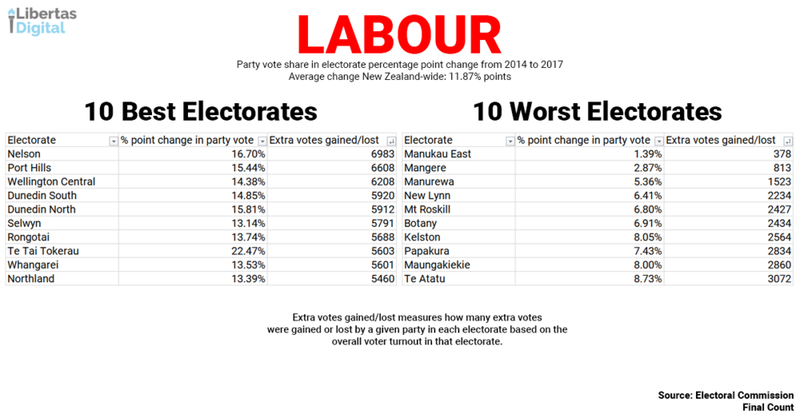 While the increase in party vote share across those nine Auckland electorates wasn't enough to offset the loses elsewhere, especially as all those electorates have lower than average turnout. Excluding Waiariki from the results (as National don't really invest much effort into Māori electorates) sees Papakura jump up into 10th spot. Where Labour did the bulk of their damage to National was in the big swings across electorates with above average turnout. With an average increase of 11.87 percentage points across the country, achieving results well above that in four of the top 10 electorates for turnout (Selwyn, Wellington Central, Port Hills, and Rongotai) was critical to their nationwide lift. Where things get interesting for Labour is how they're restored their vote in the provincial cities, where for the past three years National has had things entirely their own way. There are two positive things Labour can take from this result - they've rebuilt themselves in provincial centres and urban and inner city Wellington, Auckland, and Christchurch. Where Labour does need to reflect on their efforts is, unsurprisingly, a near mirror of National's strengths. For all we hear about West and especially South Auckland being Labour's stronghold, there simply isn't a big enough turnout in those electorates in the same way that National gets turnout in its traditional strongholds (Rodney, Selwyn and the like). New Zealand First's best and worst seem to generally make sense. Clutha-Southland likely benefitted from the various dramas down there which New Zealand First found themselves involved in, Whangarei and Northland did well from the presence of Shane Jones and Winston Peters respectfully, and I'd wager that West Coast-Tasman was helped by New Zealand First's stance on Pike River. New Zealand First's worst performers also reflect the gradual shift of Winston Peters' power base away from his old electorate stomping ground in Tauranga (and by extension the Bay of Plenty) and towards Northland. Likewise New Zealand First's policy on having a referendum to do away with the Māori electorates can't have helped them there either. At risk of setting off the National-Green Party coalition supporters group (all five of them), it's interesting that the Greens best performing electorates (e.g. the ones where they bled the least amount of support) also matched up with National's best performing ones. It could be very likely that Labour's anti-immigrant stance which likely hurt them in those ethnically diverse communities helped shield the Green Party from the hammering they took elsewhere across the country. Also of interest is where Labour did well, the Greens did poorly, demonstrating that the idea of Jacinda Ardern eating the Green Party for lunch was a very real situation. Big loses in their Wellington and Auckland strongholds cost the Greens badly, as those votes almost certainly all went Labour's way. There is a possibility too that Gareth Morgan's The Opportunities Party, which tried to somewhat position itself as a more centrist environmental party could have had an impact, especially in Wellington where TOP did well. 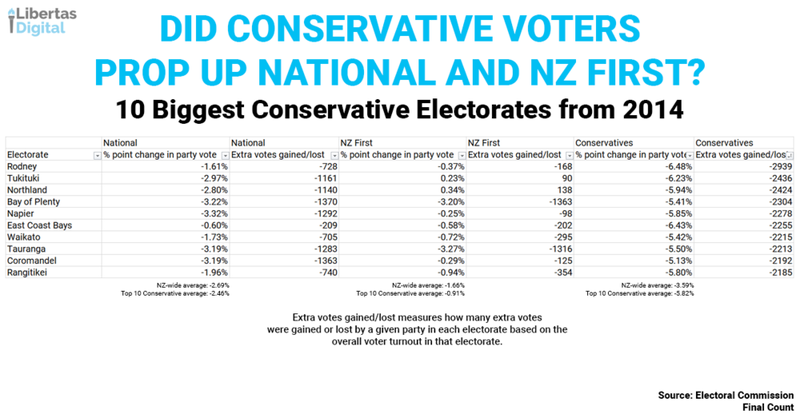 I've seen some commentary (and I've provided some myself) that National and New Zealand first were propped up by Conservative voters who had nowhere else to do after their party imploded post-2014. I generally think that commentary holds true, in that I suspect that the inflow of Conservative voters partially offset the outflow of voters from both National and New Zealand First to Labour. Of interest, where the Conservatives would have netted the fewest votes in 2014, Manukau East, Manurewa, Māngere, and Kelston are where National has done better in 2017. So while these voters almost undoubtedly went National's way, they aren't likely to have done so in such numbers to adequately explain how well National did in West and South Auckland. I'd previously tried to weight the swings in each electorate by how much votes that electorate delivered to the centre-left bloc. Generally, the predictions I came up with (anticipating the change from preliminary results to finals have held up reasonably well. The gains from Te Tai Tokerau have been eased back two places overall, and what we have now is a much better picture of where the swings were that helped Labour the most. What this illustrates is how much more important was a 14.96% swing in the Port Hills to the centre-left's fortunes than a 23.57% swing was in Te Tai Tokerau. On average there was a 10.31% swing across the country, with 3,780 votes on average moving from National to the centre-left bloc as defined by Labour and the Greens. In the Māori seats I've included them as part of the centre-right bloc with National's numbers given their role in the Government. Where things do get interesting is Labour's inability to mobilise its support in West and South Auckland. While it dominates those electorates, and did grow its share of the party vote in those electorates, there was still a shockingly low level of turnout in those electorates. That there was actually a net-swing to the centre-right in Manukau-East, albeit a small one, should concern Labour. And as a last bit, above is the breakdown of the special and overseas votes and how they fell. Notable is how much better, and how much worse both Labour and National did relative to 2014.